Shutterstock/PeterVandenbeltAmazon Go does not accept EBT cards — yet. 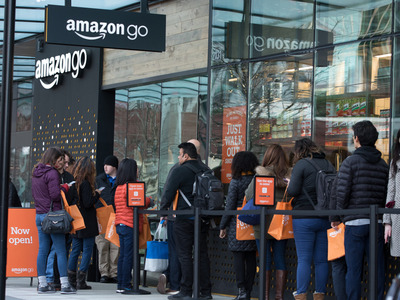 This is part of Amazon‘s play to go after lower-income customers. Amazon Prime costs $US12.99 a month, but not everyone has to pay that much for it. Amazon has been offering discounts for holders of EBT cards since June. EBT stands for Electronic Benefit Transfer, and these debit cards are the primary way that recipients of SNAP – otherwise known as food stamps – get their benefits. Amazon has now started offering the discount to Medicaid recipients as well. The discount is substantial: Amazon asks these lower-income customers to pay $US6 a month. The cheapest option for a typical Amazon Prime member is to pay $US100 a year to renew their membership on an annual basis. That translates to about $US8 a month. In 2016, Walmart generated $US13 billion in sales from customers using SNAP benefits. Amazon is also testing a pilot program with the USDA to offer SNAP benefits to online shoppers.